Our current course started on Monday 1 April. But you may not be too late. Please feel free to contact our coach, Christine Harris, to find out more (07708 118114 or Landline 02380 844339 or energybar6@btinternet.com ). 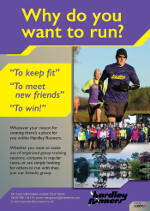 Hardley Runners is a Waterside based club affiliated to a number of sports associations including UK Athletics, the Southern and Hampshire Athletics Association, the Trail Running Association, the Fell Runners Association, British Triathlon and the Hampshire Sports Council. We currently have around 200 members, both male and female, who range from sub-6 minute mile pace to the casual jogger. Members meet at Applemore Recreation Centre every Tuesday and Thursday at 6:30pm for training runs of between 5 and 10 miles or for structured training sessions. We also meet most Sunday mornings at 8:30am, at a venue agreed each week, for a longer run of between 10 and 15 miles on forest trails. The club has a diverse membership, enjoying both road and off-road running. We participate in the popular summer RR10 Wednesday evening league in which we have had many team and individual successes and regularly enter the largest number of competitors. The 10 fixtures against other local running clubs occur fortnightly on evenings between April and August over distances of between 4 and 6 miles. We also participate in the Hampshire and CC6 Cross Country Leagues, which each consist of weekend events during the winter months. These races are just some of the free events enjoyed by our club members. We take part in the Hampshire Road Race league and have runners in the London Marathon each year. Annually we award open and age-related club championship trophies based on a local road race and a handicap trophy based on a 10k forest trail run. The latter event is followed by a pub lunch at which the draw for the club places in the London Marathon is held. We are also affiliated to Cycling Time Trials which allows any of our members to take part in both local Club Time Trials and Open events. From March to September there is a full programme of local events which cost c£3 to enter on the day. For more information see our Race Diary page. We had the distinction of being National Trail Running team champions for four consecutive years. Club members regularly take part in the prestigious OMM (Original Mountain Marathon - formerly KIMM) and the Saunders Mountain Marathon and have won honours in both events. We organise the popular Solent Half Marathon at Gang Warily and both an RR10 and a CC6 event, through which club members make their contribution to the local running calendar. We are affiliated to British Triathlon, membership of which provides entitlement to compete in British and National Championships and eligibility to qualify for GB representation. Hardley members can save £11 on their Individual BTF membership which provides a minimum saving of £4 on every Triathlon and Duathlon entry. Members represent Great Britain in Age Related triathlon and duathlon and have won National, British, European and World titles. On the social front the club holds cycling trips, theatre trips, Youth Hostel and camping weekends and our Hardley Hilly Half awards presentation lunch is always well supported. We welcome new members and our annual subscription is excellent value at £30 including England Athletics membership or £15 for people who don't want to take part in races. If you are interested in joining us or would like more information please feel free to send us an e-mail (see contact us tab). Or you can go straight to the subscriptions page.